Making Butter is probably one to the simplest things you can do at home and yet so many people don't know how to do it. 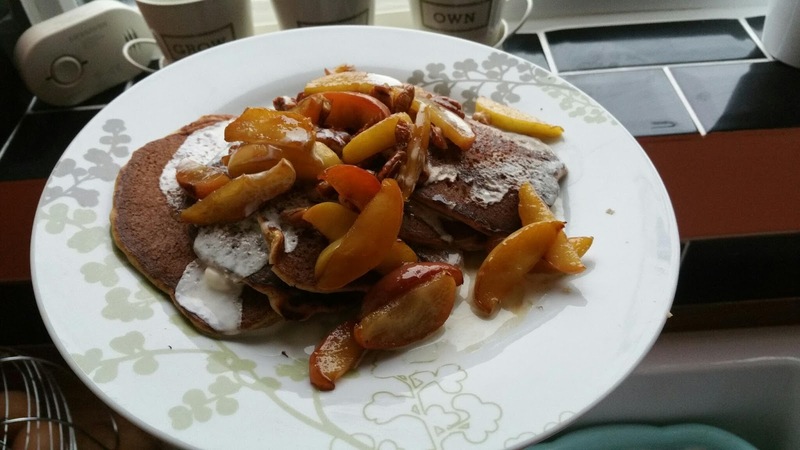 It doesn't require any special ingredients or equipment and doesn't take a great deal of time either. All you need is some double cream and a container. 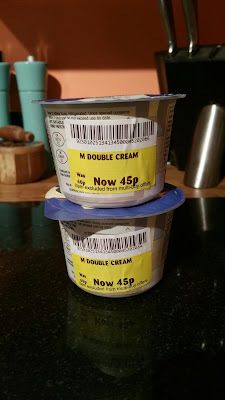 I happened to stumble across some double cream that was reduced, which is better still. 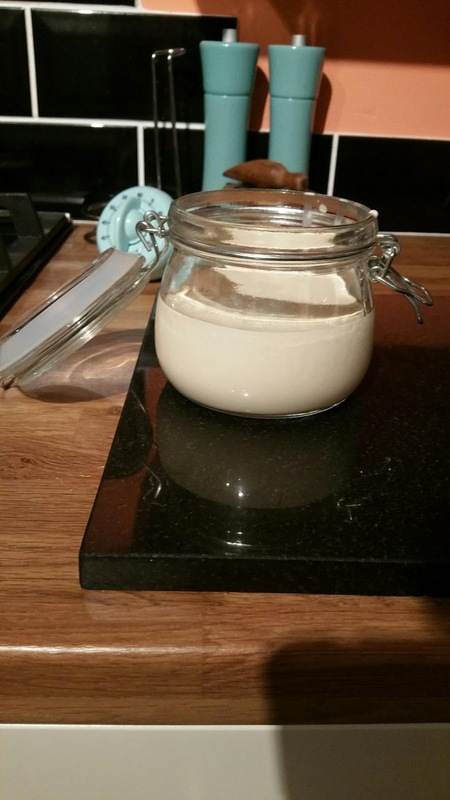 Put your double cream in to a container....and shake it. That's all there is to it, you just shake it. Depending on how energetic you are will affect the time, but within 10 minutes you ought to notice that you have a solid yellow lump (butter) and some white liquid (buttermilk), the butter will look something like scrambled egg to start with, that is completely normal. 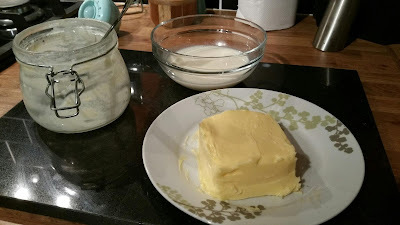 drain off the buttermilk and keep it, and if you don't have a butter press then squeeze the last bit of butter milk out of the butter using a large wooden spoon or spatula. 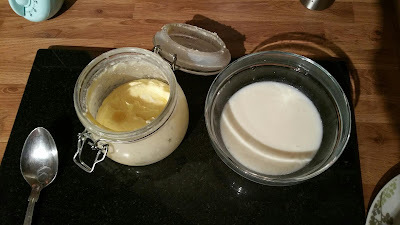 And there you have it, delicious home made butter! Perfect on a bit of home baked bread. Fast-Momma used up the buttermilk that was left over to make some amazing spelt pancakes topped with maple pecan and apple, yum! I like to squeeze the butter under running water to get the last of the buttermilk out, taste and texture is better and it keeps longer. A little coarse sea salt worked in makes it amazing. great advice Pam! We'll try that next time, although with the hungry little mouths around here our butter never needs to last more than a day or so as it'll all be gone before then, along with the bread! Something I've never done but it looks like something I should try. Be a good thing to do with the girls as they can see it happening right in front of them. Also a great way to use up left over cream.